At Edgar Snyder & Associates one of our favorite community partners is Variety the Children's Charity. We support the My Bike program providing adaptive bikes for kids with disabilities. We also support Variety's MyVoice program to help kids with communication disorders. Imagine if you couldn't speak, imagine how frustrating it is for a child. Visit edgarsnyder.com to see how the MyVoice program has changed the lives of Tyler and his family and learn how you can help. Although our business cards display titles like "Attorney," "Paralegal," "Investigator" or "Intake Specialist," we are just as proud to call ourselves fathers, mothers, grandparents, aunts, uncles, mentors, and caregivers. We know the impact and importance of helping the children in our own lives, and, as a law firm, are committed to giving back to the children and families in the communities we serve across Western Pennsylvania. We are honored to partner with local organizations that work to make a difference in our region, including Children's Hospital of Pittsburgh, Variety The Children's Charity of Pittsburgh, Make-A-Wish, and many others. We also sponsor our own initiatives, such as our annual "My Holiday Wish" Coloring Contest that has given back to local elementary schools for over a decade. This section is all about the ways we have been inspired by the amazing kids in our communities. Take some time to browse our stories, partnerships, and events, or submit your own ideas for more ways we can help. At Edgar Snyder & Associates, we believe it's important to give back to our community. We're teaming up with hockey star Kris Letang, who makes a difference both on and off the ice. 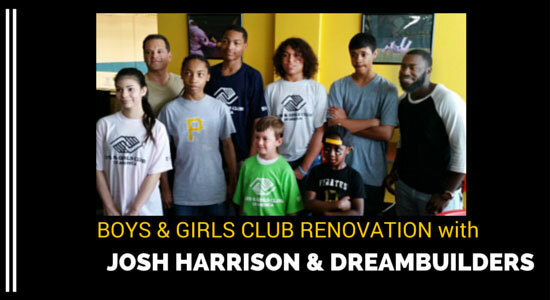 You may have seen our newest community partnership with Josh Bell on television recently. Learn more below about the Greater Pittsburgh Community Food Bank and find out how you can join us to help hungry kids in western Pennsylvania and beyond. Our law firm, along with 4 time Super Bowl champ and black-and-gold superstar Rocky Bleier and celebrated Pittsburgh baseball coach and World Series champion Jim Leyland, are spreading the word about "Miracles in Moon." The money raised through the "Assists for Kids" program will help provide custom-built bikes and communication devices for children with disabilities. Edgar Snyder & Associates is proud to team up with the Black-and-Gold's Cameron Heyward to support kids in our community. Through MyVoice, children who qualify are given their very own communication device, giving them a voice at doctor's appointments, restaurants, and at home with their families. Edgar Snyder & Associates is teaming up with some of our favorite athletes to help champion one of our shared passions: Giving back to the community. Edgar Snyder & Associates is proud to team up with baseball's Josh Harrison and the Greater Pittsburgh Community Food Bank to help feed hungry kids. Every day, about 100 kids flock to the Sto-Ken-Rox Boys & Girls Club to enjoy a range of activities, from tutoring and athletics to hanging out with friends. "We offer kids ages 6-18 programs like Homework Help programs, Dapper Dan sports leagues, swimming, arts and crafts, and more," explains Kevin Nicholson, Branch Director or the Sto-Ken-Rox Boys & Girls Club. Dreambuilders Foundation is a nonprofit organization that connects professional athletes with community programs to benefit children in need and children with disabilities. Each athlete designs their programs around the causes he or she is most passionate about. Started by former NFL linebacker Akin Ayodele, Dreambuilders has athlete "captains" in cities throughout the United States.